This blog is the first installment of clarifying common misconceptions of specific pain and functional body issues. If I got a dollar for every client who comes in and says, “I have been foam rolling (for months) and stretching my IT band and the side of my leg (or knee) is still hurting,” I would be rich these 17 years in practice. First the IT Band is NOT stretchable. “N” as in never, “O” as in ‘Oh it hurts to foam roll it’ and “T” as it is tinselly rated stronger than steel. If you have done a cadaver study you would know that the IT bands fibers are interwoven, in cross layers, and VERY thick in order to provide support for the knee and hip upon heel strike. 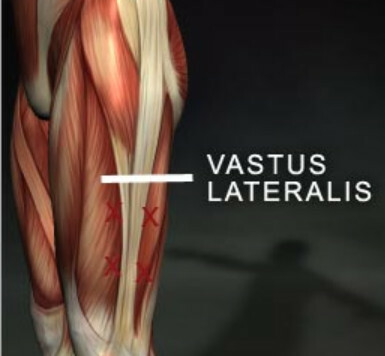 When you stretch your IT band you are actually stretching your gluteus maximus, medius and maybe a little TFL, the vastus lateralis quadriceps muscle. Secondly most people use the foam roller too aggressively causing micro trauma on top of an already damaged soft-tissue structure. (which is why it never seems to heal). Quadricep – it lives underneath, in front of and behind the IT band. The red X’s represent the myofascial trigger points that develop over time from mechanical stress and cause pain up and down the side of the leg. Your IT band and knee diagnosis may not be the issue and also misdiagnosed when the real culprit is a sick quadricep. This second picture shows all the possible X’s that can develop and their pain patterns in red. These trigger points also “trigger” pain elsewhere so the X on the middle thigh may send pain down and onto the side of the knee. Treat the quad: Use the foam roller gentler than you are used to and work in front of and behind the IT band up and down the leg SLOWLY followed by a good quad stretch. (When foam rolling use pain levels of 3-5 and breathe deep. Hold on spots that are sore for several breaths, move on and come back. Do this for 5 min per side). Foam roll your gluteus maximum and TFL muscles followed by your “IT band” stretch. If you must roll your IT band please be nice to it. It works very hard to prevent your knee from buckling all day. (Your TFL and Glute maximus muscles converge and blend into the IT band. The IT band is merely a tendon and just following orders for those two muscles). Be scientific about it. It is quadricep trigger points or actual IT band dysfunction? Just treat the quadricep as described above and not the Maximus, TFL, and IT band for a week or so and see what happens. Reader challenge: Why do we bipeds (humans) have 7 external rotators of the leg and just two internal? Get it right win a free 30 min treatment. Next episode: The IT band friction fallacy!